Long before the earth knew pollutants of any kind, a huge, ancient sea covered what is now North America. Pure, natural salt was the main ingredient of this sea, and over millions of years, the water evaporated, leaving the salt in undisturbed deposits. At some point during the earth's Jurassic era, a range of volcanos erupted around the ancient sea bed, sealing the salt with layers of thick volcanic ash, protecting these precious deposits against the pollution that man would eventually introduce into the environment. Near the small town of Redmond, in central Utah, approximately 200 miles south of Salt Lake City, we extract this hand-selected salt from deep within the earth, and bring it to you in its pure, natural state-without any additives, chemicals, or heat processing. 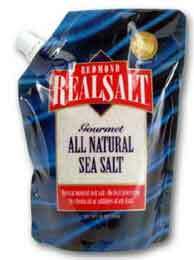 This is RealSalt, full of flavor and natural goodness-the way salt was meant to be savored!